« Peanut Butter Bread: Battle It Out? Addressing challenging behaviors is one of the most talked about topics among educators and parents alike. Here at Applied Behavioral Strategies, we are often asked for advice about how to deal with hitting, biting, self-injury (e.g., self-hitting, self-biting), and tantrums. While we would love to give a quick-fix, one-size approach answer to everyone, we have learned over the years that behavior simply does not work that way. “What?!? !” you ask. “There are no quick-fixes for behavior problems?!?!”. Sadly, we must tell you that there are no quick-fixes. Short of locking your child in the closet (which we would never advise you to do), there is no fast way to make bad behaviors disappear. What we can tell you is that with persistent and predictable parenting, the behavior will subside. However, you need to know a few things before you decide to nip the behavior in the bud. First, all behavior is a form of communication. If your child is misbehaving, she is trying to tell you something. Second, all behavior has a purpose. Children act out because, quite frankly, it works. What does your son get when he has a tantrum in Target? What does your daughter avoid when she takes all morning to get ready for school? How much of your attention is all the negative behavior demanding? Finally, positive behaviors will replace negative behaviors if the positive behaviors are reinforced. If your child is trying to get candy at the check out lane at Target, go ahead and give him candy at the check out lane. However, promise him the candy if he can get through target without any tantrums. Do not give the candy if your child has a tantrum. If your daughter moves at a snail’s pace each morning, perhaps she is trying to purposefully miss the bus. Instead, offer to take her to school but only if she is ready by a certain time.You may have to consider getting her up earlier or even helping her get dressed in order to make the bus. And, if your child must go to school in her pajamas, I can assure you she won’t be the first child to come to school in pj’s. If your child is misbehaving in order to demand all of your attention, beef up the attention you provide but make sure you are attending to the positive behaviors. We call it “catch them being good”. When children see that good behavior gets attention, they will enjoy engaging in good behavior over bad behavior any day. While we cannot solve your child’s problem in a blog post, we would like to direct you to some additional resources to help you in your time of need. First check out this great site called Technical Assistance Center on Social Emotional Intervention for Young Children.This site is full of resources, many of them free. Here you will find access to power point lectures and handouts, access to a newsletter, and information related to managing challenging behavior. If you need assistance with older children, check out this great site called the Positive Behavior Intervention and Supports. This site has information for families, teachers, and community members. Information is available regarding research, training, and program evaluation. Find out who is available to help in your state! 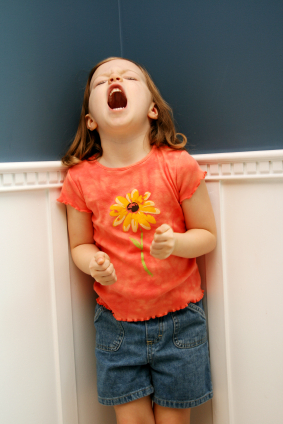 I came across a nice parent- and teacher-friendly post regarding challenging behavior. The authors, Elizabeth Erwin and Leslie Soodak, provide some helpful information regarding why behaviors occur and how to address them. Finally, you can always submit your question to receive help during our Ask Missy Monday blogs. Simply email: askmissy at applied behavioral strategies dot-com. The bottom line is that the sooner you address the behavior problem, the better. Happy Parenting and Happy Teaching! Very true.Parents must take control of the child’s behaviour before it is too late! Once the children enters teen years it is almost impossible for parents to redirect the negative behaviour. You are right! and they are much bigger in the teen years!